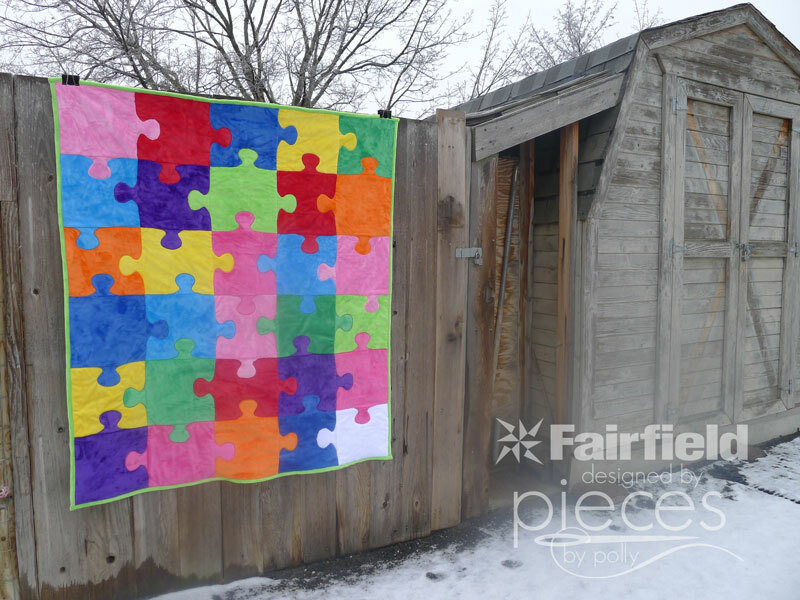 This puzzle quilt isn't nearly as hard to make as you might think. It's all just a bunch of squares with the "knobbies" as I call them appliqued on. Our family is a big fan of puzzles. We have more puzzles in our house than I would like to admit, and my almost-three-year-old does puzzles ALL-DAY-LONG. 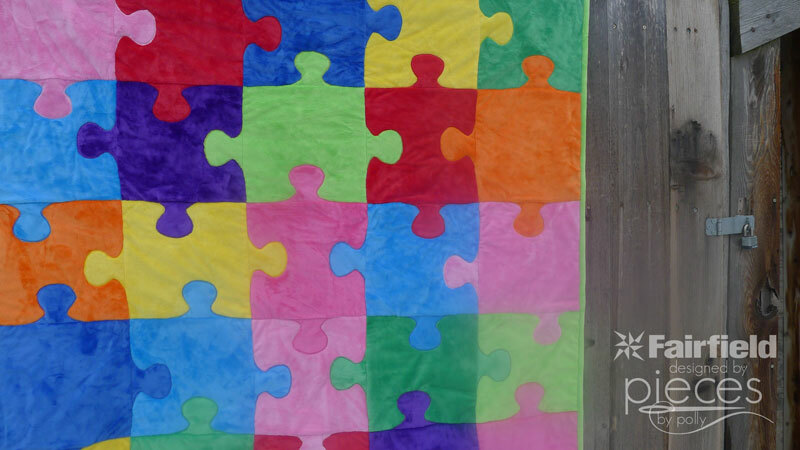 In fact, his baby blanket is the first puzzle quilt I ever made. 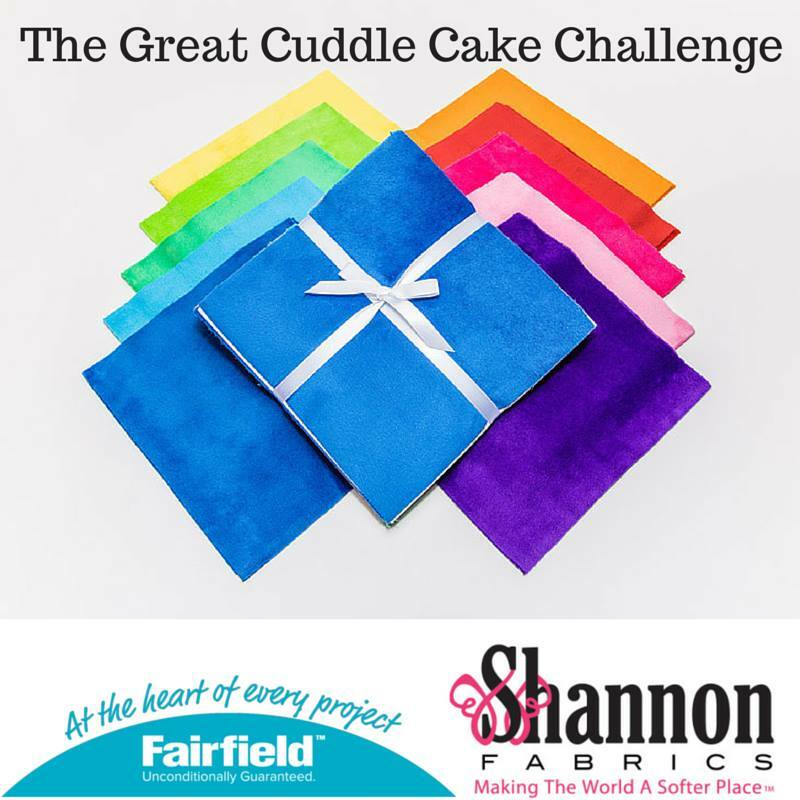 I was asked to participate in the Great Cuddle Cake Challenge being put on by Shannon Fabrics and Fairfield to celebrate their 20th and 75th anniversaries respectively. 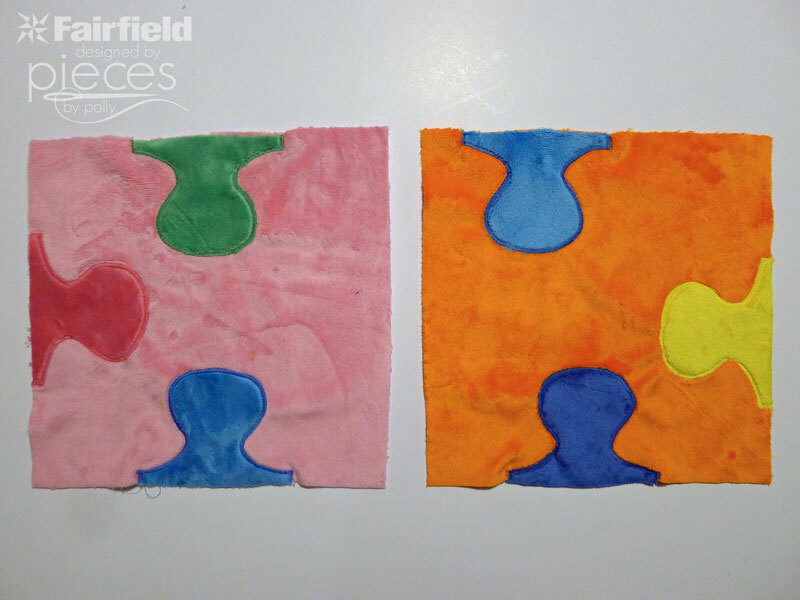 Each Fairfield Master Maker was sent several packs of Cuddle Cakes and asked to create something unique and inspirational. This project took on special meaning, when I received news that a friend from high school had passed away very suddenly, leaving a wife and young daughter behind. When someone is grieving, quilts and blankets are one of my first thoughts because it's almost like sending a long distance hug. I wanted something that could be symbolic to the girl of her dad, but at the same time be bright and cheerful and not be overtly obvious as a memory of a passed loved one. (I didn't want the girl to have to explain what it meant every single time someone saw the blanket.) I also added a cross as an accent to the back because his faith was so important to him and his family. So I decided a puzzle quilt with one white piece would be appropriate. 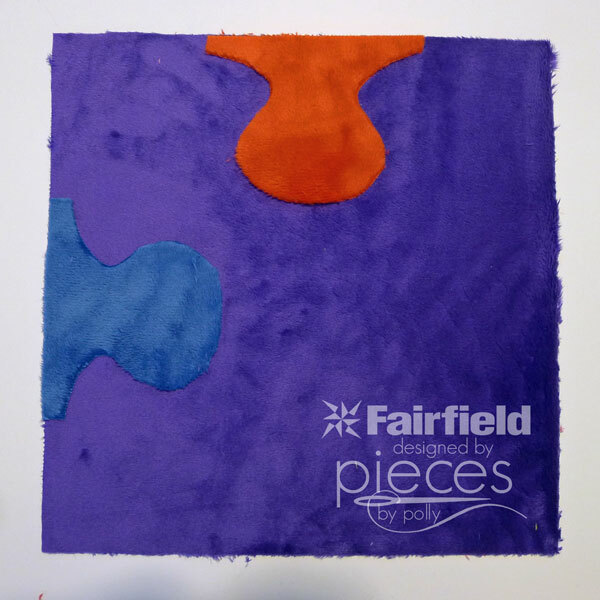 The white piece is to represent the piece that her dad will always be in her life, even if he's not physically present. 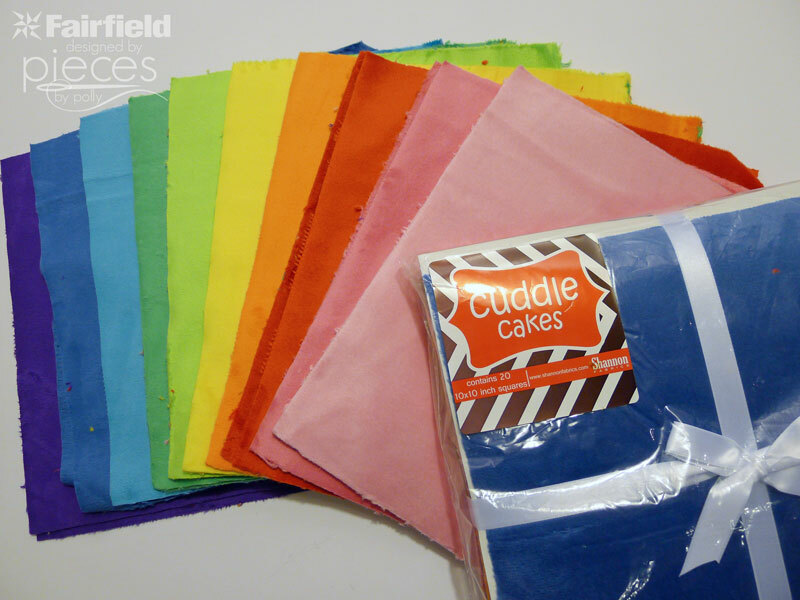 I'd like to thank Shannon Fabrics for giving me the Cuddle Cakes (packs of 20-10 inch charm squares) and cuddle fabric for backing. 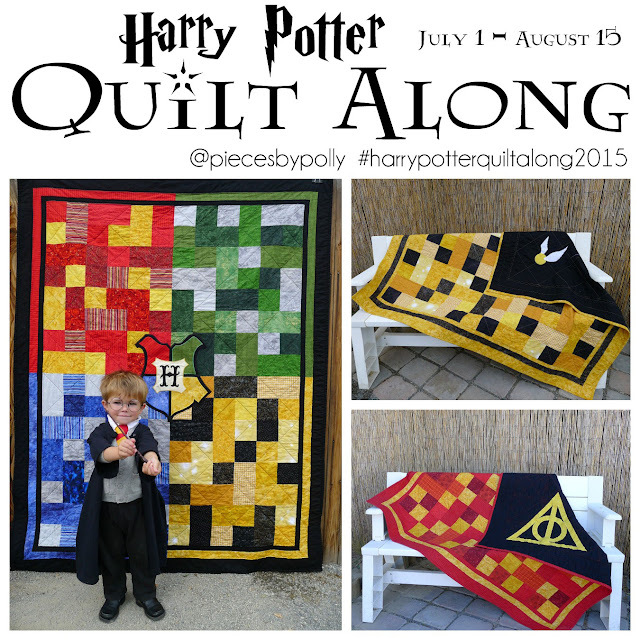 They are SO SO thick and soft...absolutely perfect for this pattern and the purpose of this quilt. Also, thank you to Fairfield for contributing the batting and compensating me for this post. All opinions and ideas expressed here are 100% mine, and all compensation I received for writing this post was donated to the family who lost their dad. And with that...on to the project. 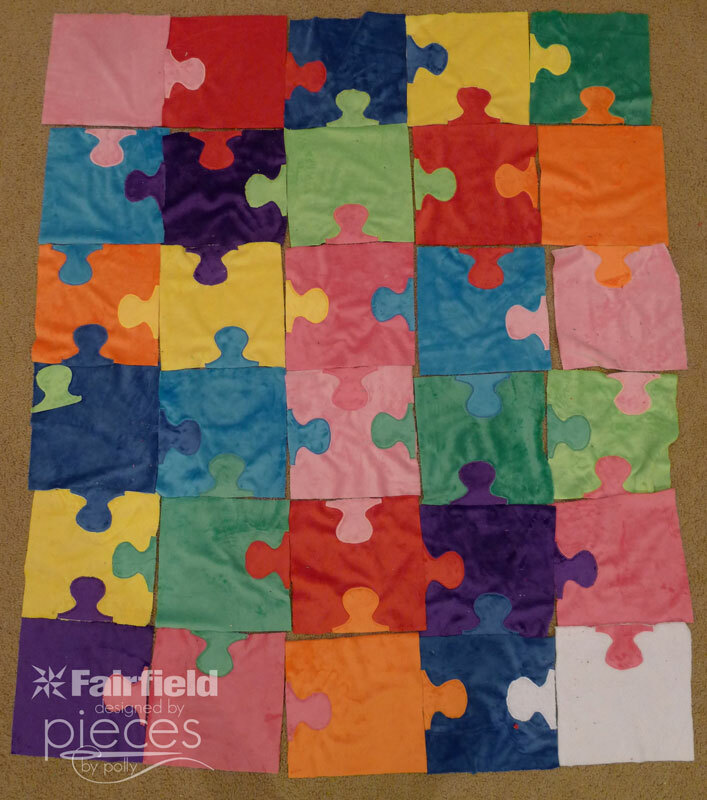 If you want to add a white piece (or some other color), you'll need to purchase 1/3 yard of Cuddle, which gives you enough for 5 squares. 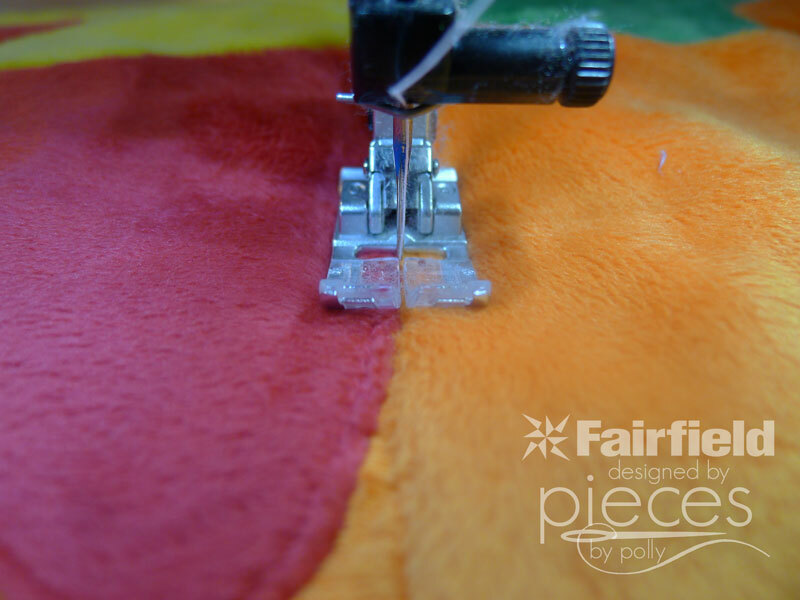 If you've never sewed with cuddle fabrics before, take a few minutes to read the tips offered by Shannon Fabrics on their website. Take your stack of 30 squares and figure out your layout. You'll have 6 rows with 5 squares each. 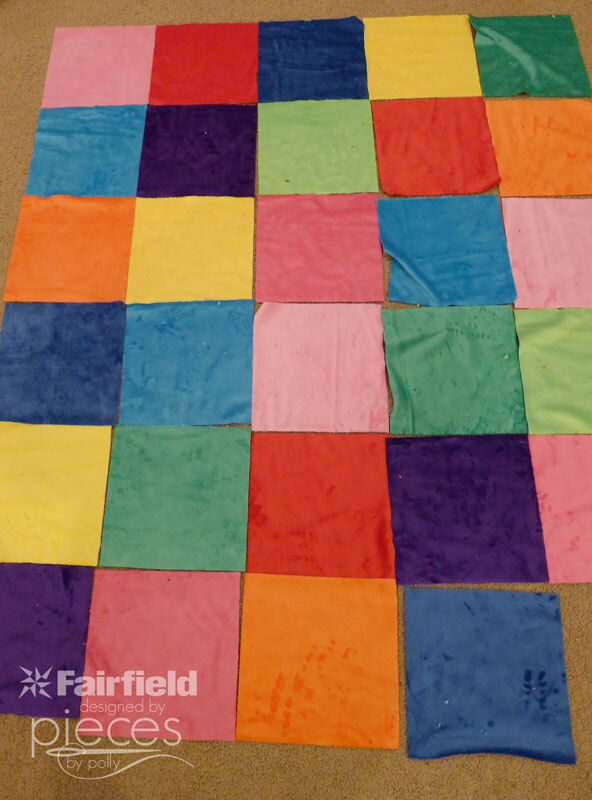 Check each color and make sure that it's fairly balanced throughout the quilt. The empty space in the picture is where I pulled one square out to have a place for my white square. If you're not adding a white square, then you'll have the perfect number of squares. 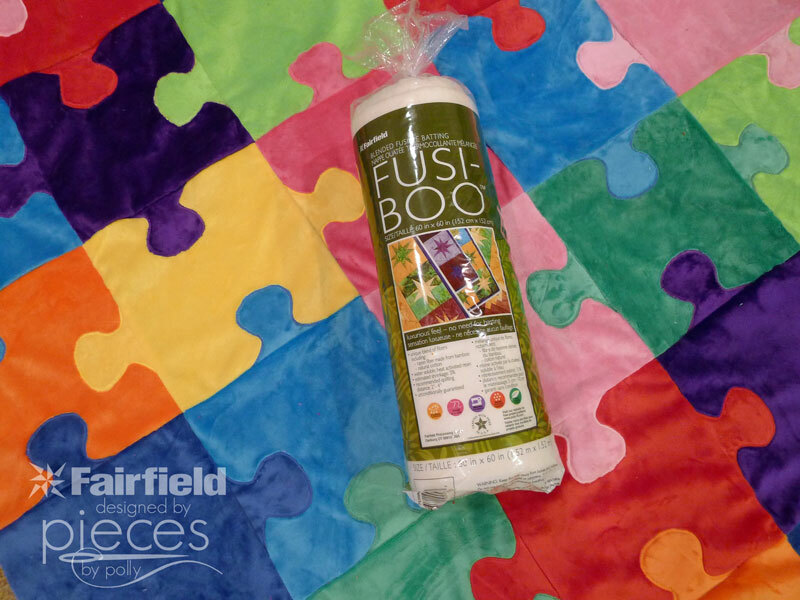 Cuddle fabric does have a nap...meaning the fabric smooths down in a particular direction. Check to make sure the squares are all facing the same direction. 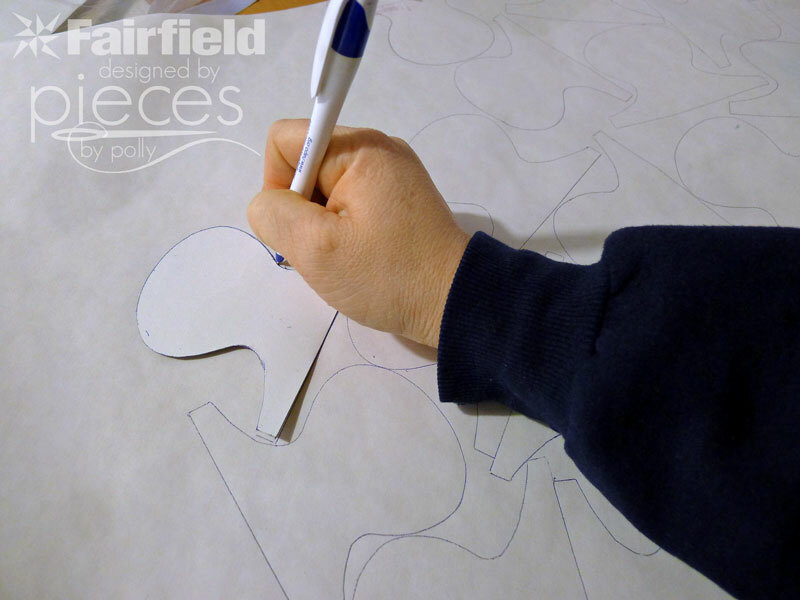 Next trace 49+ knobby shapes onto your paper-backed fusible web. You'll need a minimum of 49 knobbies. I usually find that I need a few extras because I may end of wanting more of one color than another color, depending on your layout. 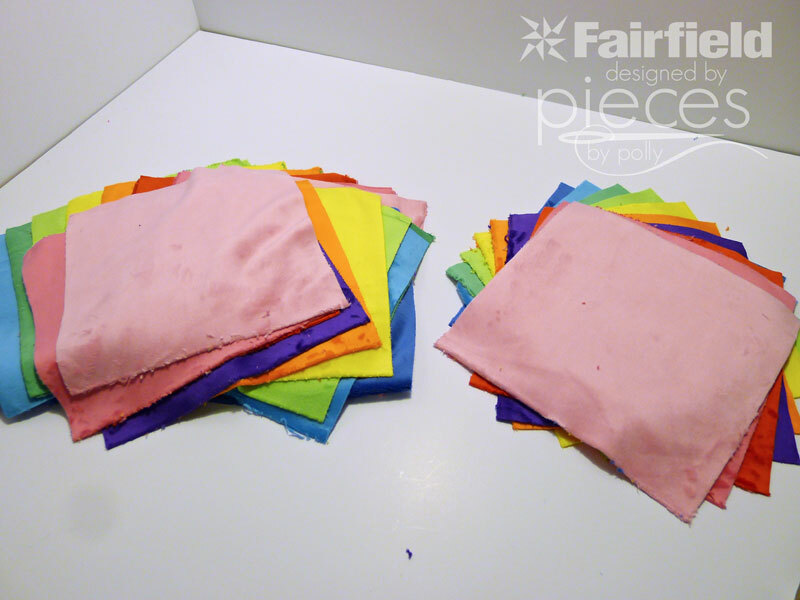 Now take your stack of 10 squares (one of each color) and iron 5 knobbies onto the BACK of the square. 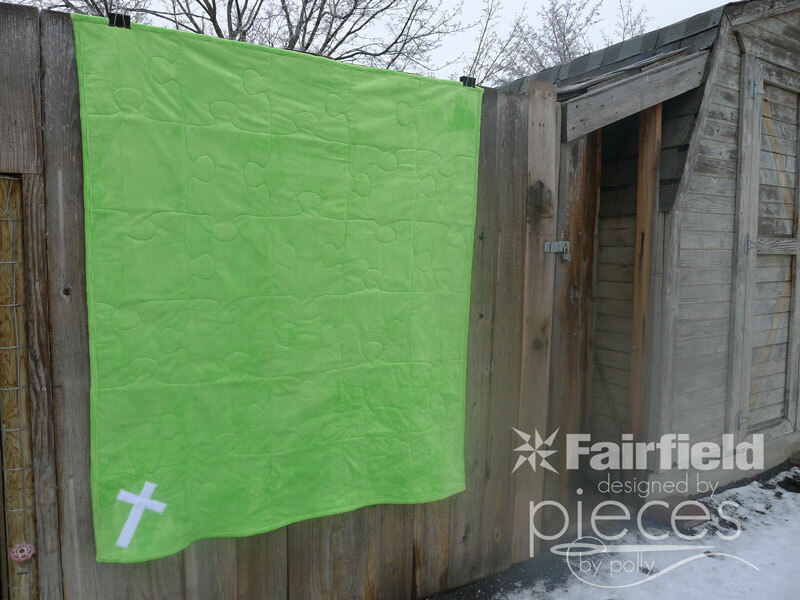 (Use the warmest setting that your fabric will tolerate. 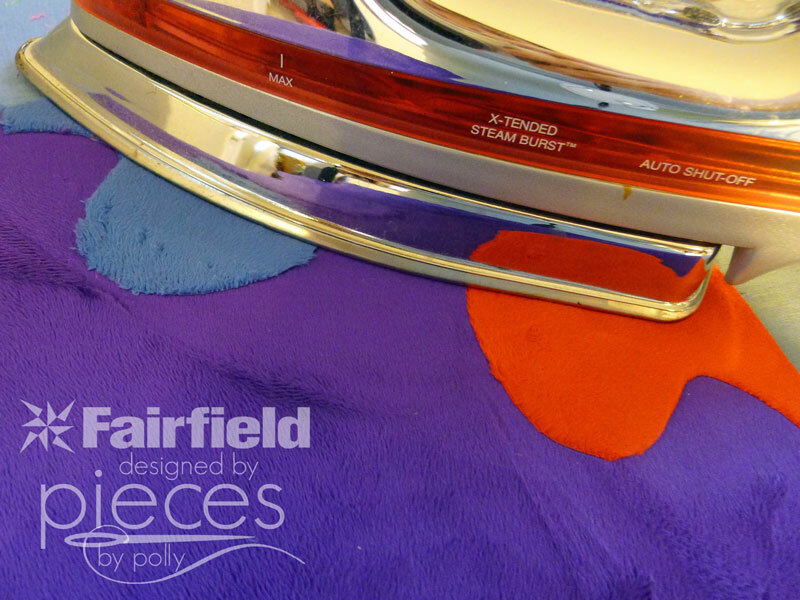 Cuddle is made from polyester, so you do NOT want to use the hottest setting on your iron.) Be sure to test your iron on a corner of your fabric first. 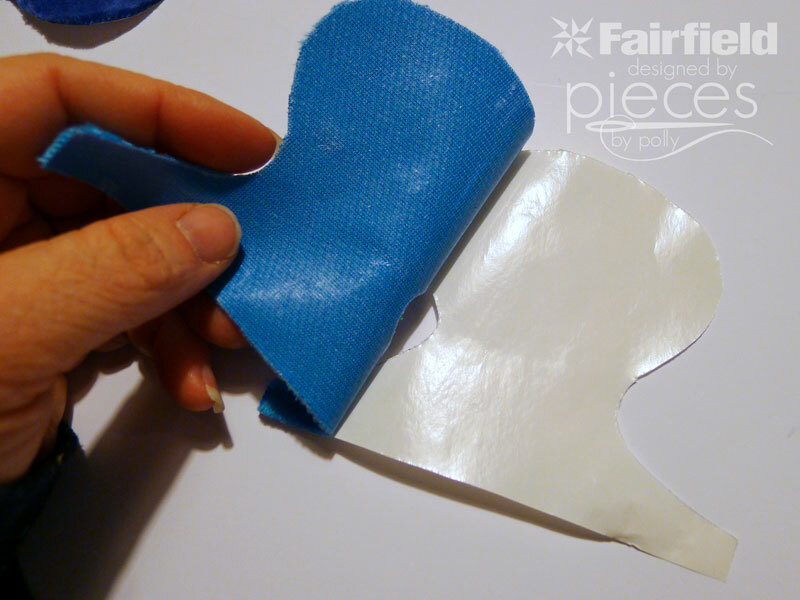 Peel off all the paper backings. Have fun arranging your knobbies. 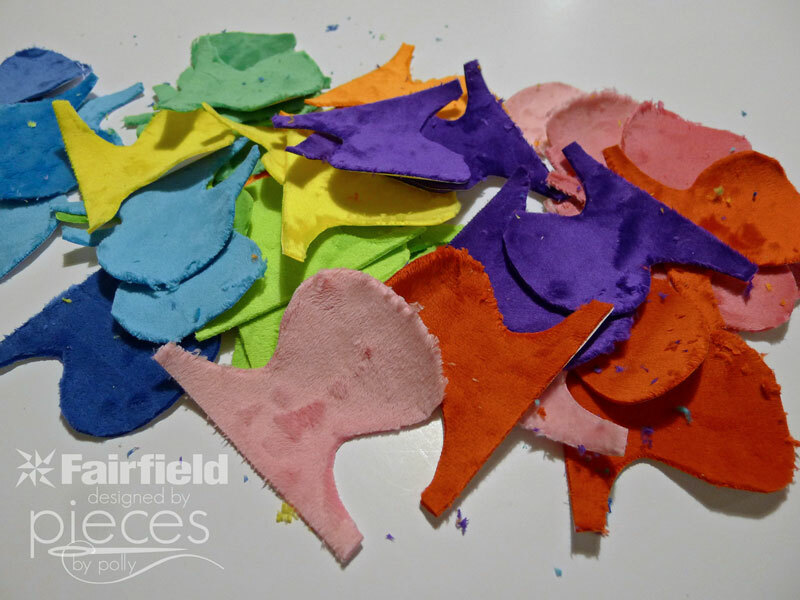 You can lay them out in a particular pattern...for instance two in-ies and two out-ies on each piece...or you can arrange them kind of randomly. Do yourself a favor and snap a picture, just in case something messes up your squares and you can't remember who you had them arranged. I tried as much as I could to have the nap on the knobbies go the same direction as the nap on the base squares...but it wasn't always possible, and it really wasn't noticeable in the finished quilt unless you were really searching for it. 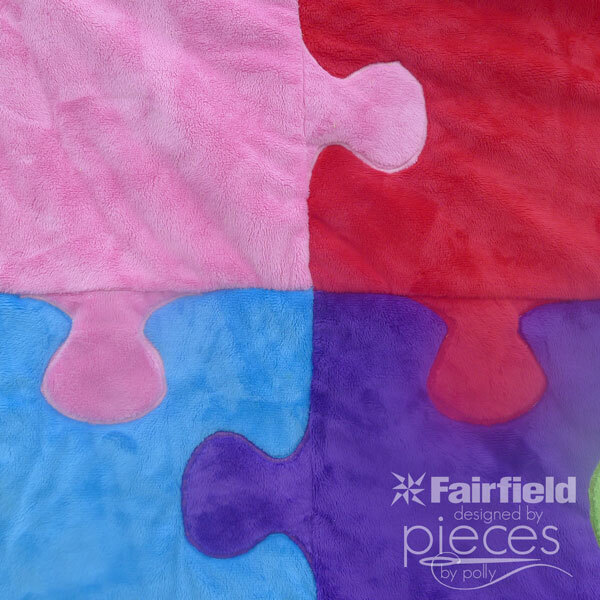 If you look at real puzzles and puzzle pieces, there are all sorts of combinations. You might also want to have fun with having some of the knobbies off center. Once you're happy with your placement, it's time to start ironing and sewing your knobbies. Because each color needed it's own thread, I worked on one color of knobbies at a time. For instance, I did all the red knobbies first. Then I moved onto the orange, etc. You'll want to iron the knobbies to the squares on the polyester setting for your iron. I ironed it from the front, until I was sure it was somewhat attached and then flipped it over and ironed it more thoroughly from the back to make sure all the edges sealed. 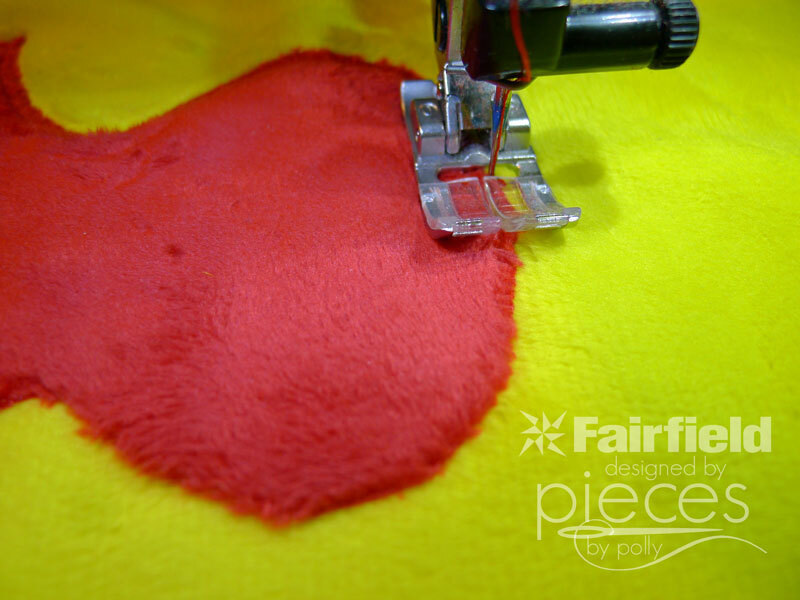 If you're using a tear away stabilizer, you'll want to use that on the back of your fabric before you start stitching around each of the knobbies. 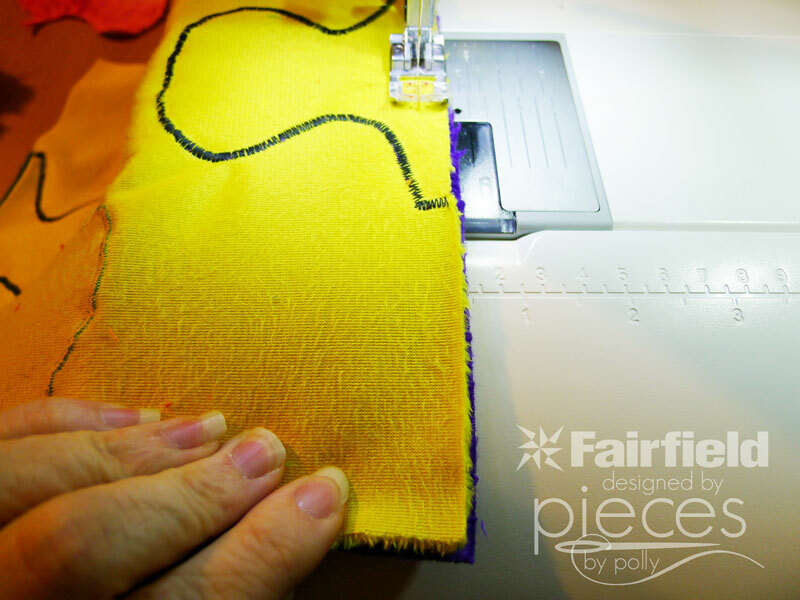 Set your sewing machine to a very tight zigzag or satin stitch. You'll also want to use a walking foot for your machine if you have one available. If your machine didn't come with a walking foot, they're definitely work investing in. I purchased a universal walking foot for my old machine for about $15. My new sewing machine has a built in even-feed feature, which is essentially a built-in walking foot, which is why a walking foot doesn't appear in the photos. Stitch around the edge of each of your knobbies. 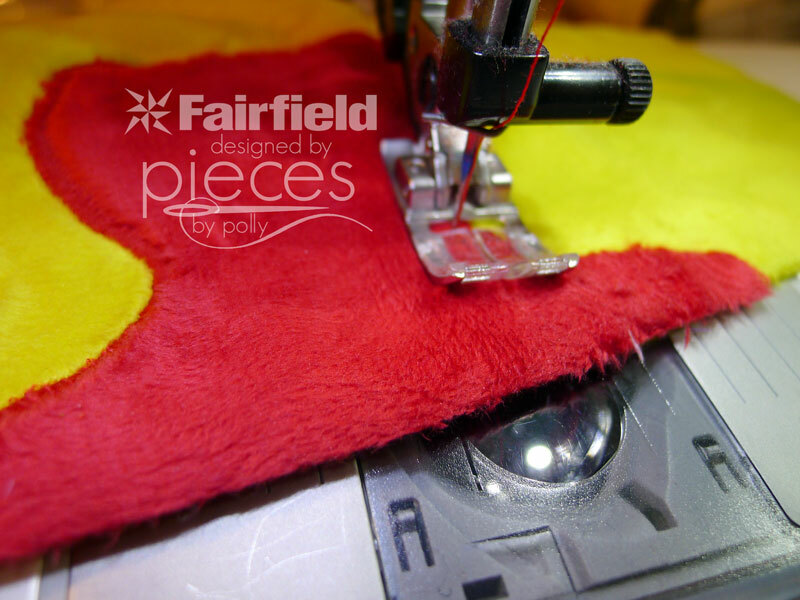 Since the ends of your seams will be hidden inside your seam allowance, there is no need to backstitch. Repeat for all 49 of your knobbies. It's a little tedious...but the end result is well worth it. Now all it takes is sewing your blocks together. I usually sew quilts with a 1/4 inch seam, but because this fabric is so much thicker, I used more like a 3/8 inch seam allowance. 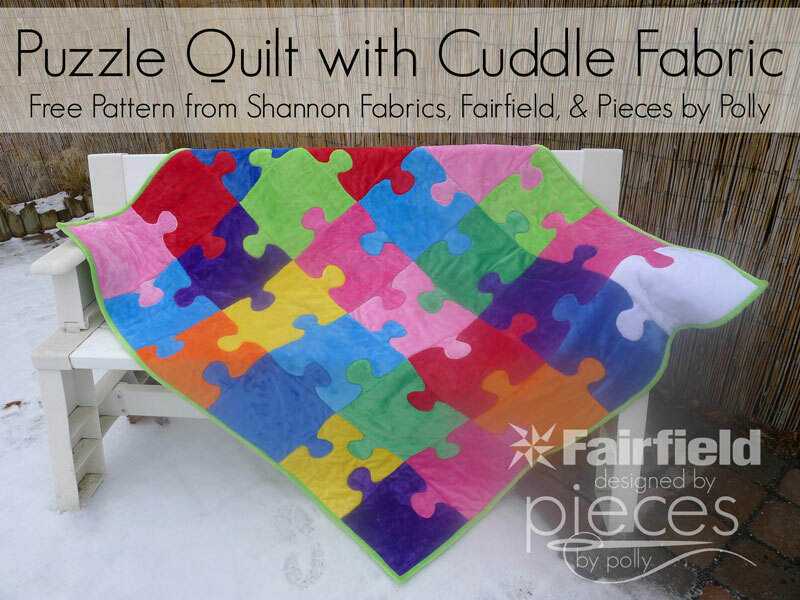 The Shannon fabrics website strongly recommends lots of pinning to work with cuddle fabric. The even feed feature on my machine was able to handle it without pinning, but I definitely would have needed more pinning on my older machine. I sewed my blocks together in twos and so on until I had 3 strips that were 2x5 squares. Then I sewed the strips together to finish my quilt top. For the quilting, I recommend "stitching-in-the-ditch." 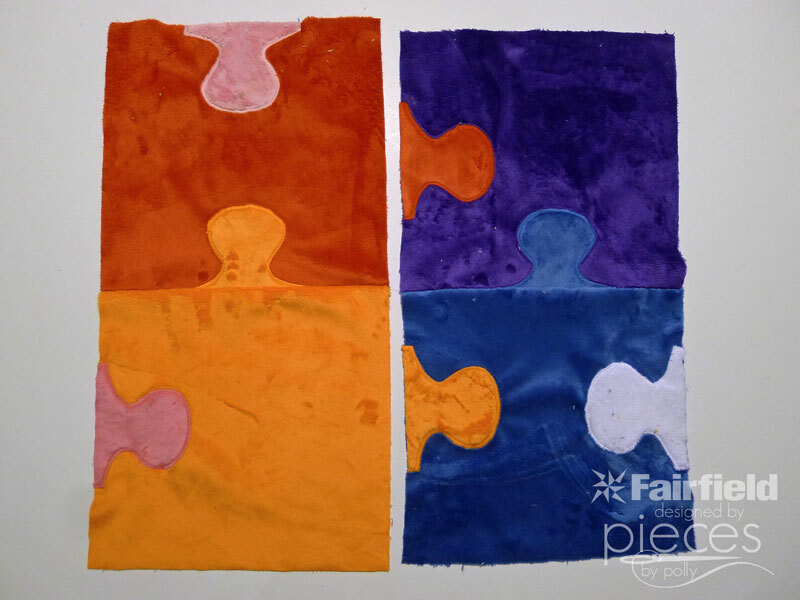 With more traditional quilts, I usually quilt 1/4 inch to the sides, but the Cuddle fabric hides the stitching sew well, that you don't see the quilting threads at all and it really emphasizes the puzzle shapes. On the parts with regular seams I stitching right through the seam. On the parts with the knobbies, I quilted right next to the zigzag stitching, but in the other color fabric. (For instance here, the knobby had red zigzag stitching, so I was doing the quilting, just barely into the orange fabric. 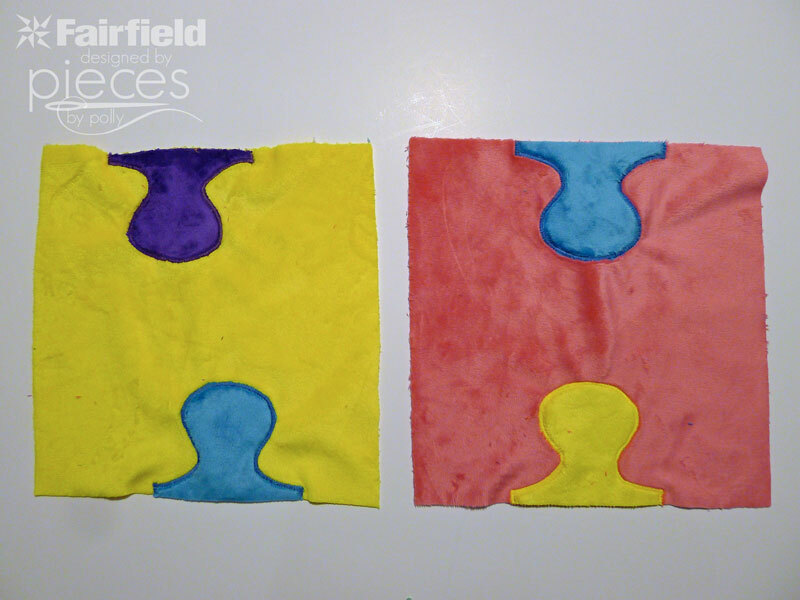 Quilting in the ditch also gives a really fun puzzle pattern on the back. I was a bit scared to tackle binding with the Cuddle fabric, but it really wasn't difficult at all. In fact, I thought it was more forgiving than regular cotton quilt binding. Definitely read the tips for binding on the Shannon Fabrics website. I've been scared of sewing with Cuddle fabric because of the stretch factor...but it really wasn't much of an issue for me. Now I'm in love. You will be too. 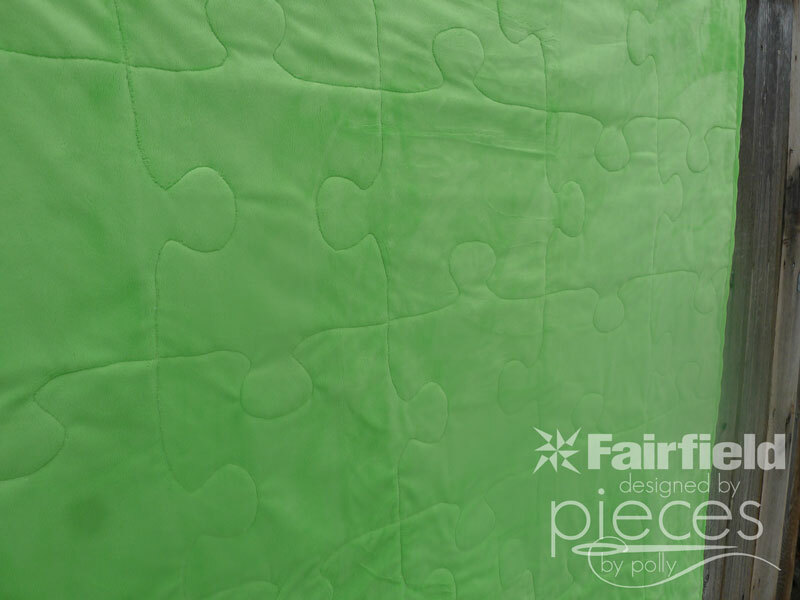 I prefer the flat finish Cuddle fabric to the dimpled Cuddle...just my taste, probably because I'm a quilter from way back and it's closer to the flatness/texture of quilting cottons. However, my fabric-loving 5-year-old is definitely more of a fan of dimpled Cuddle. You'll end up with cuddle dust everywhere, but it cleans up easily, so it wasn't an issue for me. 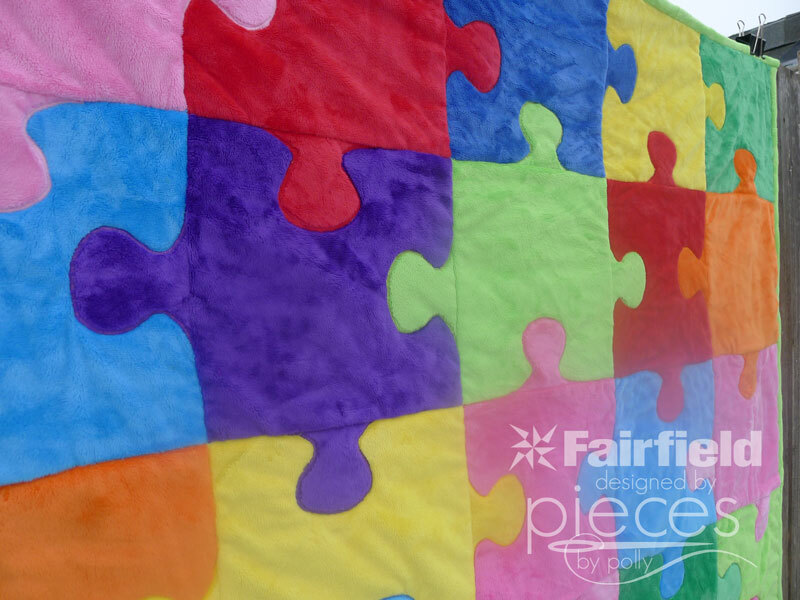 Like any fabric...not all Cuddle/minky fabrics are created equal. 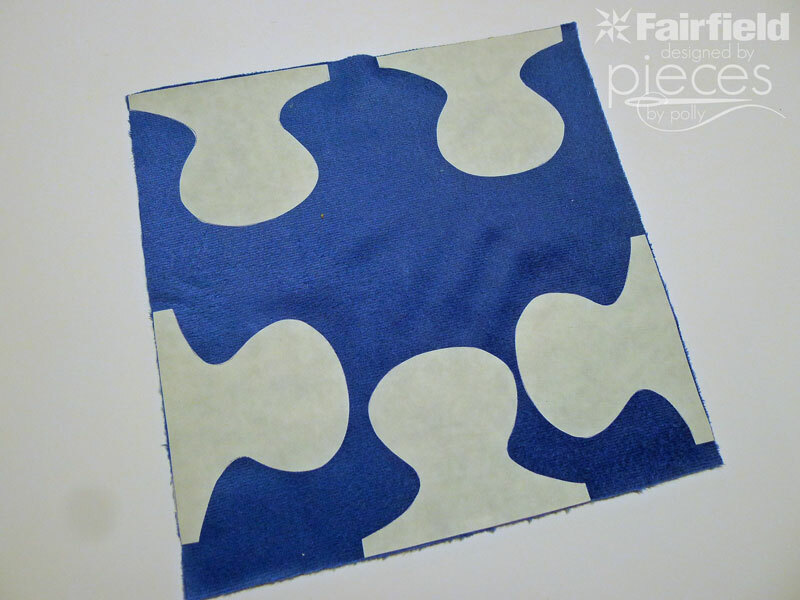 I purchased the white minky at a local chain fabric/craft store, and it was much harder to applique with. Also on closer inspection it was not nearly as lush and thick as the Shannon fabrics Cuddle fabric. 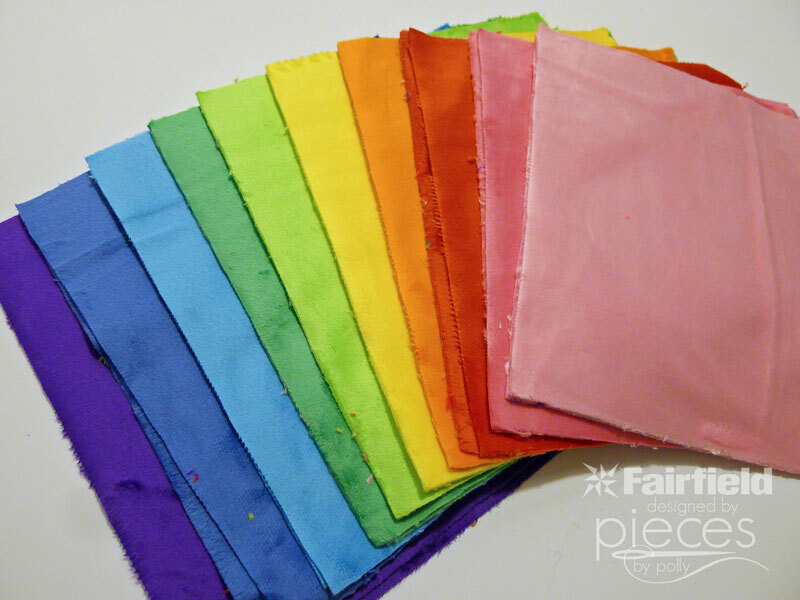 It's really worth the trip to your favorite quilt shop to get the good stuff...I was just in a time crunch as I wanted to get the quilt made and sent off to the family and my local quilt shop is 45 minutes away from me. 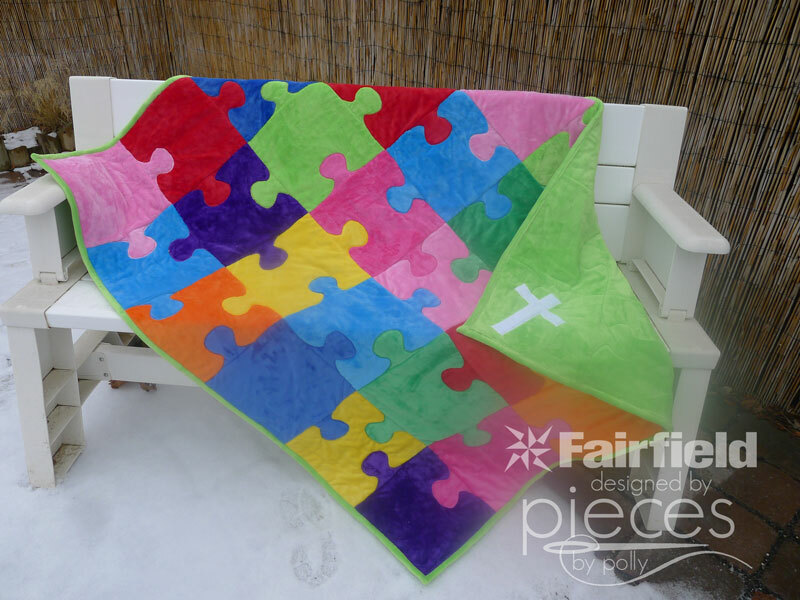 The Cuddle fabric, with the addition of the batting in the middle, makes a denser finished blanket/quilt than regular quilting cottons, which I personally love in a throw blanket for the couch of one for a child to cuddle. My kids had a hard time giving the blanket up, we all knew where the blanket belonged. 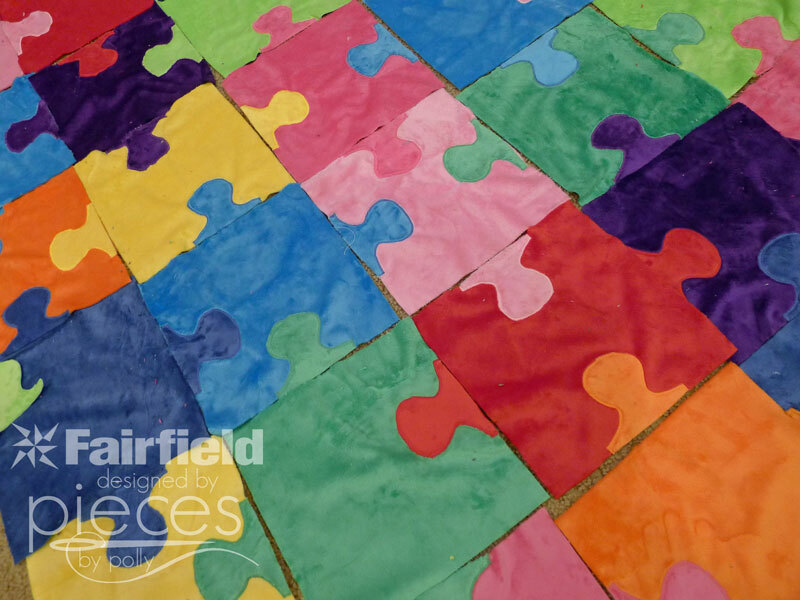 Be sure to go here to see the other Fairfield Master Maker's Cuddle Cakes projects, and be sure to enter to win your own Cuddle Cakes. The colors are wonderful and the fabric delightful. Thanks so much for the tutorial. Such a lovely quilt! 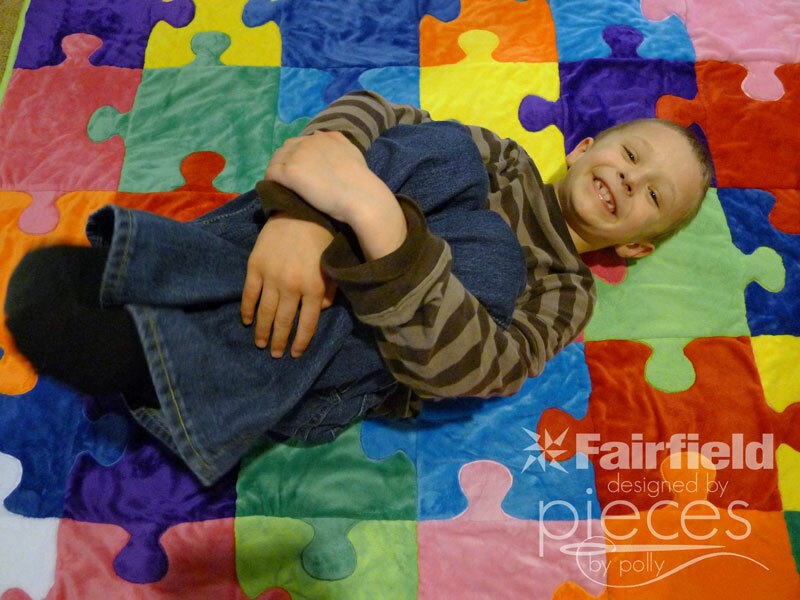 I love puzzles, and I pinned this quilt! This gives me a great idea for the quiet book I'm working on for my grandson. Wonderful colors. This is amazing Polly! What a beautiful gift....a true treasure! This piece is stunning, and truly a work from the heart. What a beautiful gift to your friend's daughter! 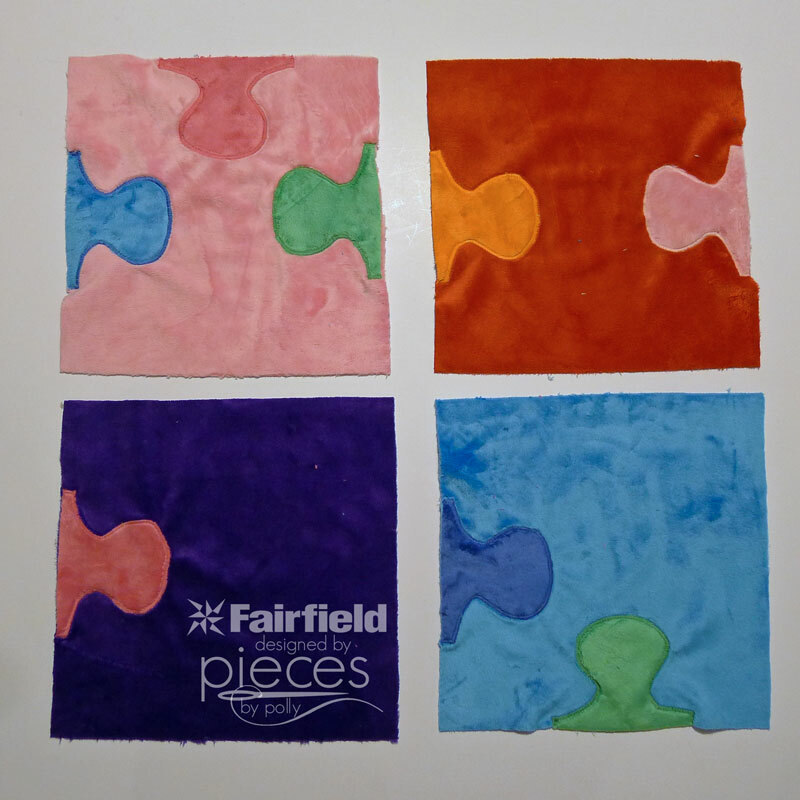 Just found your blog, Google directed me here when I searched for a puzzle pieces quilt tutorial to make for my neighbor's autistic son. 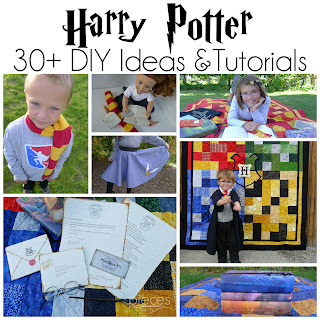 Definitely bookmarking this tute! And I got here just in time to sign up for your giveaway!